The heads of the Bulgarian National Bank have expressed their reserve with respect to the idea of the nationalist party Ataka to tie the interest rate on bank credits with the interest rate on bank deposits. The Governor of the BNB Ivan Iskrov and his three deputies met Monday with the leader of Ataka Volen Siderov to discuss the nationalists’ ideas for a new mechanism for bank regulation. 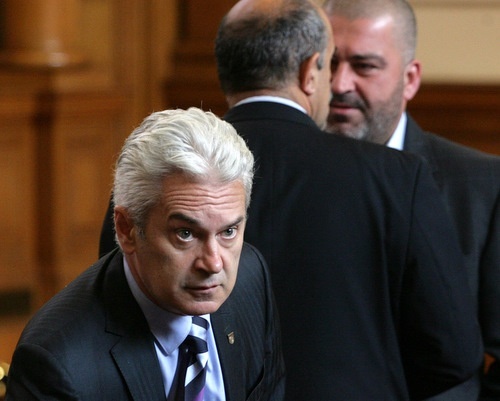 On Sunday, Siderov, whose party Ataka is a major ally of Bulgaria’s ruling party GERB as it provides it with the necessary votes for a parliamentary majority, announced the formation had new legislation ideas for a future national economic strategy, including the adoption of new regulation stating that the maximum level of interest rates on credits should not be 0.5% higher than the interest rates on deposits. In addition, the Bulgarian National Bank is proposed to set the average interest rate on bank deposits every six months. The nationalist leader believes that the Bulgarian banking sector is not affected by the crisis and is generating huge profits without providing proper credits to the real economy. His ideas, however, were not welcomed by the BNB Governor Ivan Iskrov, after the three-hour meeting on Monday. “The BNB Governor approached conservatively Ataka’s idea for a new economic philosophy and state regulation of interest rates,” Siderov himself announced after the end of the meeting. He did underscore the fact that all top managers of the Bulgarian central bank were present at the meeting, and that the two sides had a very profound discussion. He also beliefs that the idea for a new economic philosophy is met with understanding in principle by the bankers. “We can’t do it only with accounting measures. The belts can be tightened but the most tightened belt is the belt of the dead person. It can’t be tightened any more. Just belt-tightening measures will not lead to an improvement of Bulgaria’s standard of living,” Sidervo declared. According to a statement of the BNB, the major topic of the talks with the nationalist party was focused on expressing concern over the efficient banking policies in Bulgaria that would respond the needs of the economy based on the current situation. “The management of the BNB has expressed its reserve with respect to the ideas for administrative regulation of interest rates on bank credits. BNB believes that at this stage it is necessary first and foremost to follow closely and analyze the development of the banking regulation with the EU,” says the statement of the central bank. It explicitly declares that its utmost priority is the stability of the Bulgarian banking system and of the currency board.